Colonel Rachele Smith is from Bartelso, Illinois. She graduated as a Distinguished Military Graduate from Eastern Illinois University in 1992. Her first assignment was with the 187th Medical Battalion at Fort Sam Houston, Texas where she served as a Company Executive Officer and the Battalion Training Officer. In May 1995, she reported to Fort Bragg, North Carolina. During her tour at Fort Bragg, her assignments included Secretary to the General Staff for the 44th Medical Brigade, Chief, and Patient Administration Division (PAD) for Womack Army Medical Center, Medical Regulating Officer (MRO), Training Officer, and Detachment Commander for 55th Medical Group and Patient Administration Officer for XVIII Airborne Corps. In September 2001, she was assigned to the 86th Combat Support Hospital (CSH). Where she served as the Chief, PAD during two deployments, S2, and Chief of Administration for Soldier Health Services. In July 2005, COL Smith moved to Germany. During her tours in Germany, she served as the Chief, PAD for Heidelberg MEDDAC, Hospital Executive Officer for the 212th CSH, the Chief, PAD and the Reintegration Team Chief for Landstuhl Regional Medical Center (LRMC). She also commanded the Mannheim, Coleman, and Heidelberg U.S. Army Health Clinics in USAG Baden-Württemberg Germany. In June 2013, COL Smith returned to FT Sam Houston, Texas, to serve as the Commander, 187th Medical Battalion. Additional assignments during her tour at Fort Sam Houston included Assistant to The Surgeon General at the AMEDD Records Processing Center, San Antonio, Texas and the Director, Patient Administration Systems and Biostatistics Activity (PASBA). 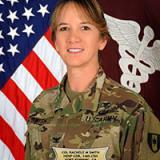 Her most recent assignment was with the Army War College as a Fellow for the United States Department of Veterans Affairs in Washington D.C. COL Smith is also appointed as the PAD Consultant to the Army Surgeon General serving as the subject matter expert on patient administration and health information management. Her deployment experience includes one peacekeeping mission in support of KFOR and two combat deployments in support of OIF and OEF. All three were early entry deployments where she served as Chief, PAD and MRO. Her awards and decorations include the Legion of Merit, two Bronze Star Medals, and six Meritorious Service Medals. She also wears the Army Superior Unit Award, the Expert Field Medical Badge and the Army Parachutist Badge. During her tenure at LRMC, she was presented the Polish Armed Forces Medal for her work supporting our wounded Polish service members. She is also inducted into the Order of Military Medical Merit (O2M3). She earned a Master of Science degree in Health Services Administration through Central Michigan University. Her military education includes the AMEDD Officer Basic and Advanced Courses, the Combat Casualty Care Course, the PAD course, the Joint Medical Planners course, the Combined Armed Services Staff School, Joint Planning course, Command and General Staff College, the Lean Six Sigma Black Belt course, the Medical Strategic Leaders Course and Army War College Fellowship Program. Check out the incredible speaker line-up to see who will be joining Rachele M. .